Looking for any help after exhaustive search for makers mark CROWN PLATE semi circle around a crown. To the left E.P.N.S. under the crown A1 and to the right 89A. Closest I have managed are the guys doing the Indian silverplate with 1 image having crown plate from Jewellers Inc I think and Crown Silverplate Company Toronto Canada. I have photos but havn't figured out how to download yet. https://postimages.org (copy the 'Hotlink for forums' code) or http://www.tinypic.com (copy the 'IMG Code for Forums & Message Boards') are recommended. Both sites allow your images to be resized during upload. Please try to embed your images rather than posting links and remember to use the 'Preview' button before submitting your post. If your images don't show up there we won't be able to see them either. I am old so have no idea what I have done in uploading an image on tinypic. The code is possibly http://i66.tinypic.com/2hr1zba.jpg. Can the admin let me know how this turned out. Looking for any help after exhaustive search for makers mark CROWN PLATE semi circle around a crown. To the left E.P.N.S. under the crown A1 and to the right 89A. The top is crimped to form domes. 3 handles appear to have gargoyle type heads on top. Thanks Trev very much appreciated. Will now attempt to put full picture of the bowl. Here is the next attempt they gave me a choice of message board size . Hi again have I think put in wrong code. An Octagonal tray (located with seller in Australia) shows this round "Crown Plate A1" mark accompanied by straight line wording "Silverplate" underneath...no item/line number seems to be included. After I cleaned it and it showed number 89A I presumed it would be a well known make. I am unable to find anything further on Crown Plate. Will post a clearer photo of makers mark now I am sort of up to speed with tinypic thanks to Trev. I had wanted to put in that the makers mark may be some type of forgery. 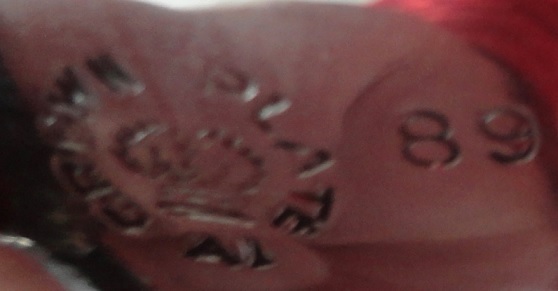 The CROWN MARK A1 and EPNS all appear to have been etched in by hand. The 89A is the only part that appears to have been stamped in. CROWN PLATE also appears to have been hand etched.